Happy team ready to share the joy of Prolotherapy with the people of Honduras and the team of international doctors. Cavallino: ONLY glucose/lidocaine/saline (sugar water). Dr. Cavallino working with physicians who are learning Prolotherapy. JOP: How many visits do your patients typically need? Cavallino: I would say a minimum of three to maximum of eight visits. JOP: How is Prolotherapy perceived in Italy? Cavallino: It is not known at all. It will take time and patience to convince the medical society that Prolotherapy is harmless and can cure many people, especially ill people that cannot undergo surgery, who are on blood thinner medications, and definitely unhealthy people with chronic pain. Italy is successful with Prolotherapy because patients by “word of mouth” tell the real life results. JOP: Are there any Prolotherapy organizations in Italy? Cavallino: Yes, SIPRO – Societa Italiana di Proloterapia. www.proloterapia.net. JOP: Where do you think the future of Prolotherapy is headed in Italy? Cavallino: Very soon it will be exploding! JOP: Is there anything else that you would like the international JOP audience to know about you? Cavallino: Yes, I’m trying very hard to pass on the message that we need to inform the public more and especially doctors need to realize how important Prolotherapy can be for so many ill people with chronic pain. 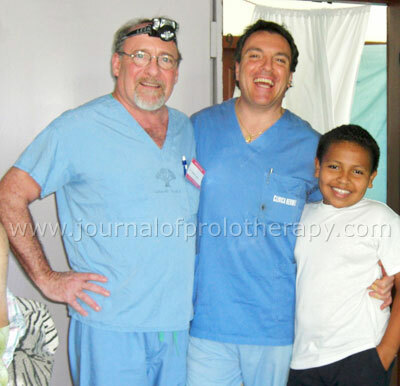 JOP: Thank you Dr. Cavallino for your time and sharing with our readers about your practice. Cavallino: Thanks for this opportunity to prove how Prolotherapy has cured many Italian people.